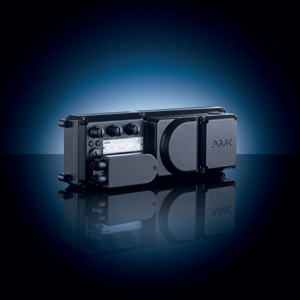 With the new AMKASMART iC servo drive, AMK is offering a compact device for closed-loop control of servo motors up to 10 kW peak power that can be installed practically anywhere in the machine. The device accepts an input voltage range of 3-phase 480/400 VAC. Integrated line filter, brake chopper, and 24 VDC control power are internal parts of the compact housing. The decentralized (cabinet-free) iC servo drives are optimized for use in single-axis applications and modular machine structures. Combining decentralized drives in modular designed machines has never been so easy. The integrated power supply module in the iC eliminates the need for a control cabinet and makes machinery and plant design not only easier but also much more flexible.